MIS’-CEL-LA-NY — n. 1: a mixture of various things. linking back and forth … many of them fit with other items on this site. And somewhere there may be a good idea you can use! In Scrapbook #24, Brian Wilson, from Sidney BC, Canada, showed us Tsehum Harbour, an unusually shaped On30 and On18 layout (16.5 and 9 mm gauges). At the lower right edge of his plan is an intriguing feature — a dual-gauged crossing where the slim gauge crosses the even slimmer gauge. 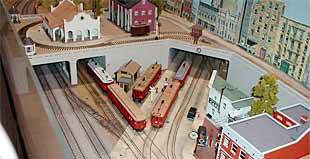 Brian has now roughed in that part of his pike, and sent this photograph of the area , which is an interchange between the two gauges. Nice modeling, eh? 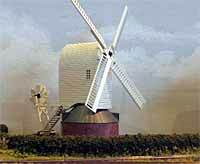 For more, see Brian’s website. 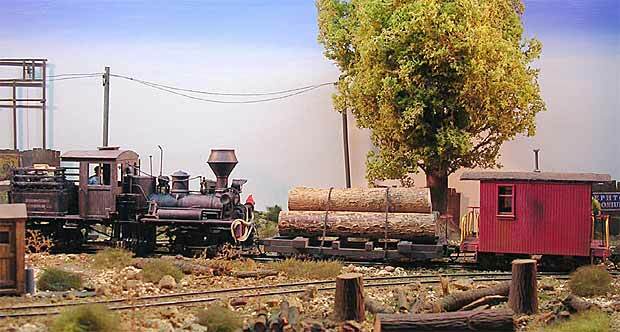 In that same issue #24 of the Scrapbook is a visit to Fabrice Fayolle‘s fabulous farrago, the Josephtown Craddonium Co. Fabrice, who lives in Amiens, France, has contributed two final photos from his exhibition layout… both showing off his On30 shay and impressively modeled log car. For more, see his website. Another update, from Scrapbook #33, shows progress made by Tony Maude, Pastor of the Peebles Baptist Church, Scotland. 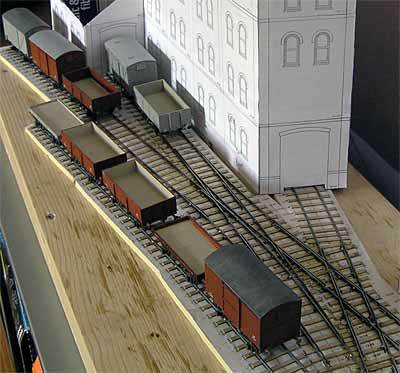 His P4 layout, Candy Mill, uses prototype-scaled rails, flangeways, and wheels as well as exact 18.83 mm gauge, Tony has now roughed out the buildings using card stand-ins, and shows his growing roster of wagons and vans. Note the great-looking trackwork! 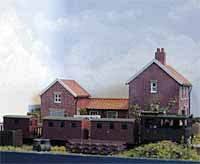 Chris O’Donoghue, a frequent contributor to the Scrapbook and member of the Greenwich & District Narrow Gauge Railway Society in England, sent in this dramatic collage as a concept for a layout. 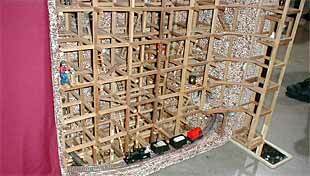 Chris’s comments: “Inspired by the Pett Level Tramway, the Cliff End Railway is really only a simple 16.5mm gauge oval test track which will give me a chance to run my 10hp Planet loco [shown in photo]. 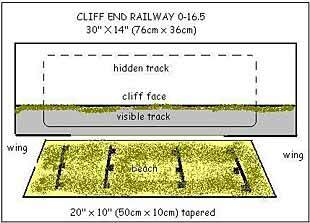 “The Tramway was laid by the quaintly named Rother & Jury’s Gut Catchment Board (gut = outflow) to assist the building of new sea defences at Winchelsea Beach in East Sussex, U.K. 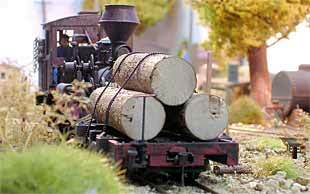 It was a two foot gauge line built along the foreshore and ran for about five miles to link up with a gravel pit line. 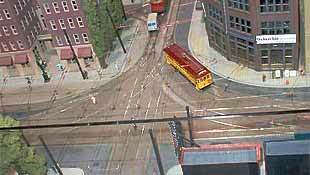 After reclamation work in 1946 the tramway was more or less abandoned although I understand that there was still track in place in the early 1950s. 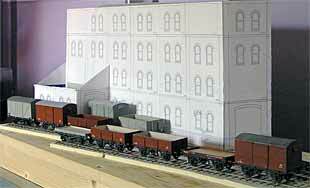 “Cliff End Railway, although simple in plan, has pretensions to be grand in execution. 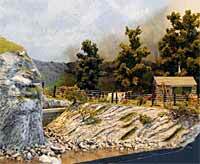 The cliff face could be anything from 50 feet to 100 feet high (a scale 350mm – 700mm). 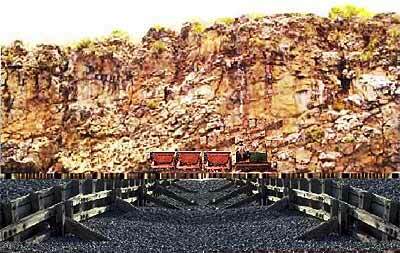 As tunnels through the cliff face would be most improbable, theatrical ‘wings’ will be used to hide the exits with a proscenium arch and hidden lighting. To extend the depth a beach panel, trapezoid in shape to create false perspective, will be built in front with plenty of scope for detailing. Battered timber groynes, rock pools, the ribs of a rotting hulk, seabirds and plenty of sand and gravel will provide a visual feast. 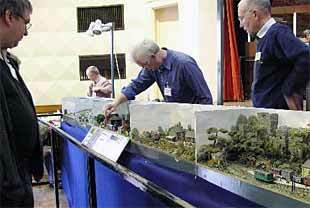 “To add some operational interest, a simple mechanism could be built so that skips could discharge their loads on to the beach below, thereby justifying such a preposterous idea!” All in all, a grand excuse for building some spectacular scenery! 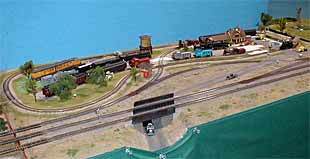 Speaking of seaside railroads, Pete Strutz, from Edgerton Wisconsin USA, sent this picture of his On30 pier railroad modeled after the Walmington Pier Tramway line from our Micro Layout Design Gallery. 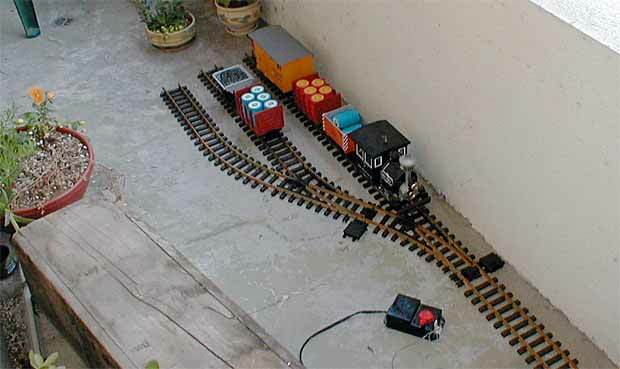 It’s modeled on a 10-foot pine board and uses a Bachmann trolley that can be programmed to proceed along the track, pause at the end, then return to the shed. 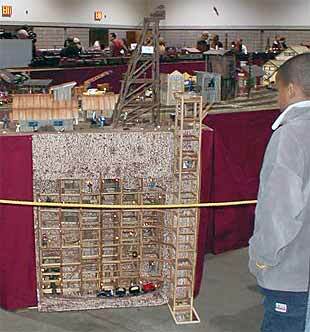 Jeff Hartmann, from Long Beach California USA, liked the look of the Ginglenook small-space G-scale layout in Scrapbook #38, so he built one using sectional G track. 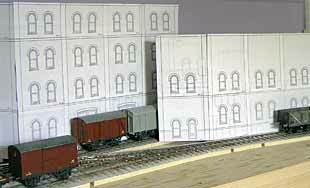 Jeff wrote, “I had long been disappointed that the balcony of my condo wasn’t wide enough for a loop of G scale track. 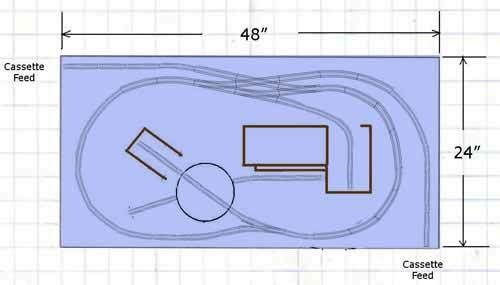 Your ‘Ginglenook’ layout was just thing to put together and spend a pleasant afternoon of outdoor railroading.” Great idea! 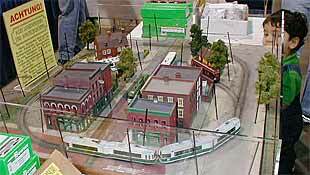 To explore Jeff’s other model railroad activities, see his website.